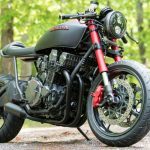 Industrial Moto showed us a real nice lineup with custom bikes with out of the box creations like this CB750, this XV. 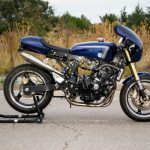 Mark Long, the photographer, and copywriter of Industrial Moto was a bit in doubt about this project: “I know that you have featured a couple of Industrial Moto customs lately, so I will not be offended if you choose to pass on these. They don’t exactly fit in one of your usual categories anyway”. And I asked myself? Why should I pass? These little machines look cool, unique and a lot of fun; the perfect mix for a feature here on the blog! 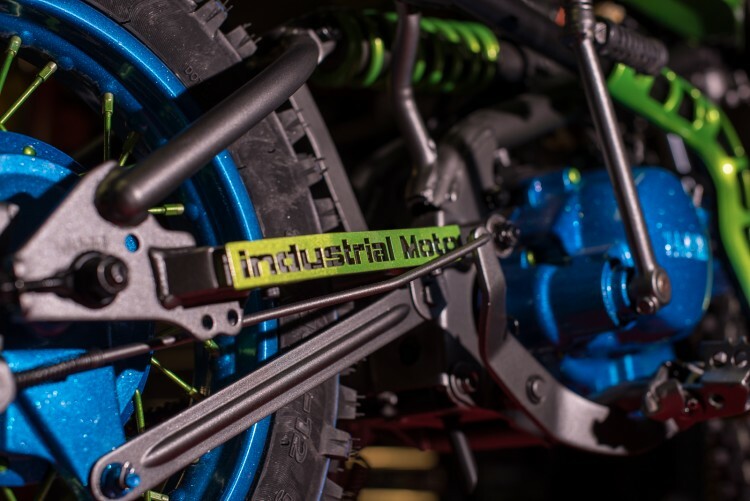 Words by Mark: Industrial Moto is a family oriented business. 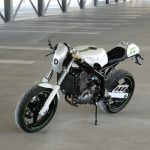 Until today our café racers have defined our product line, but this holiday season Industrial Moto is introducing a couple of bikes with a younger crowd in mind. 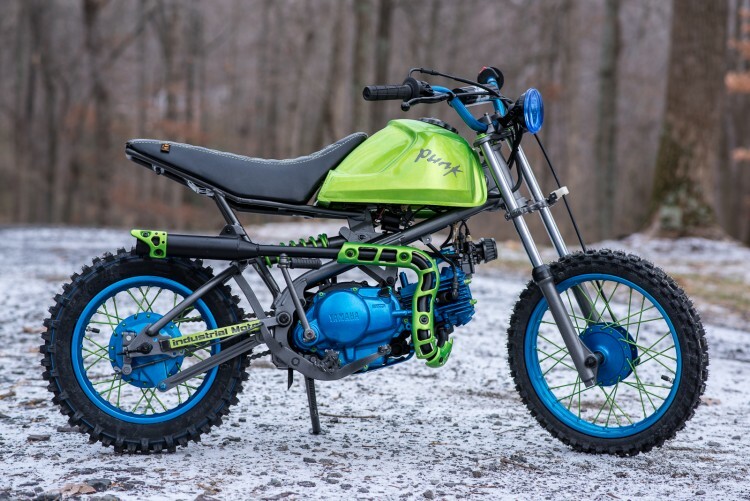 Whether your Christmas list includes a 12-year-old who is dying for a dirt bike and deserves something truly unique, or you are shopping for a 30-year-old who doesn’t want to grow up and needs a cool pit bike to tool around on between track day sessions, here is the solution. 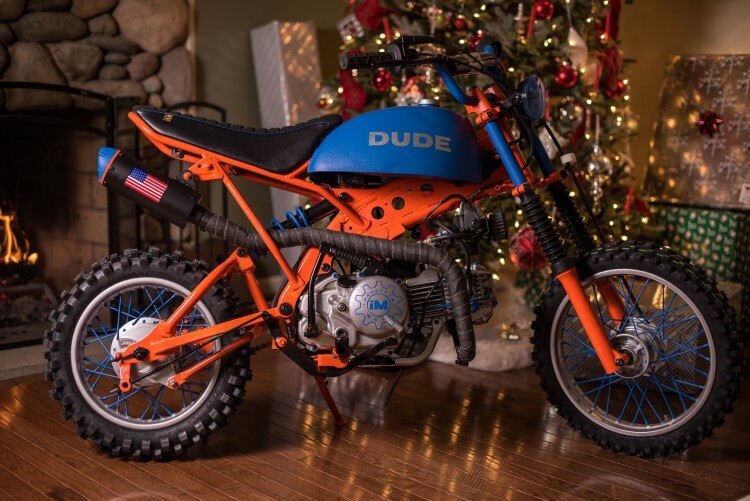 Project Dude started out as a 2006 Kawasaki KLX110 and Project Punk started out as a 2001 Yamaha TTR-90. 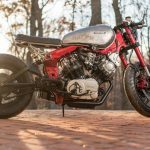 These bikes have both been given the complete industrial Moto treatment. They were completely disassembled, stripped of all finishes, and powder coated. All bearings and seals were replaced. The suspension components have been completely refurbished, and the motors were rebuilt and checked for all factory tolerances. They both run like new, but look way better than new! No other kid anywhere will have one like it. 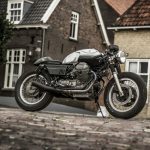 These are one-off custom builds without the usual custom bike price tag. 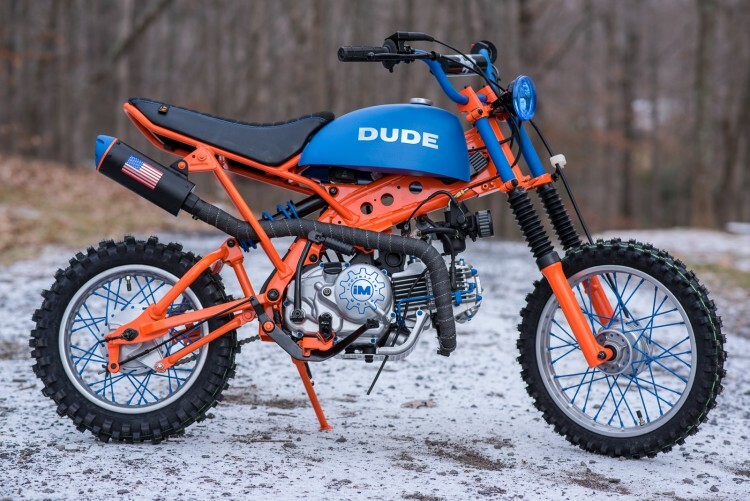 The gas tank for Dude came from a 1978 Honda ATC 110, and Punk’s from a 1982 model. 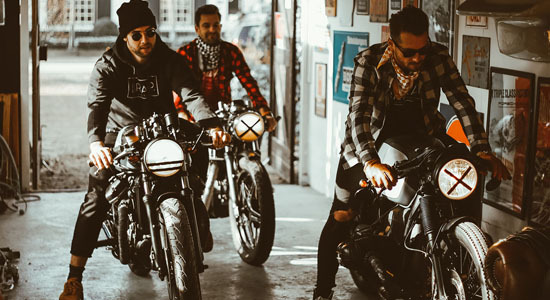 Both bikes have custom seats finished by Tuffside – tweed fabric with blue stitching and leather trim on Dude and leather with green stitching on Punk. 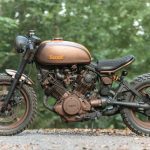 They have been fitted with premium off-road tires, Scott grips, new sprockets and chains, and a working headlight. 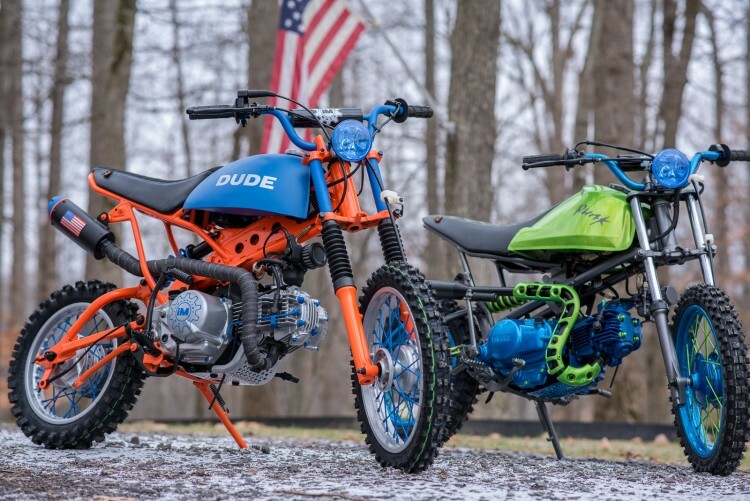 The colors are sure to stand out wherever these bikes go. The attention to detail includes powder coated bolt heads and nuts to match the color scheme. 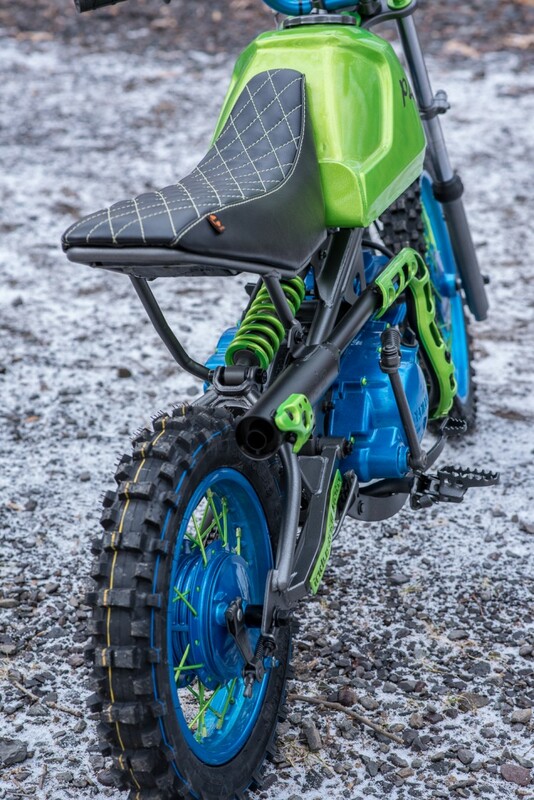 The unique gas tank and seat combination give each bike a unique look that you will not find anywhere else. 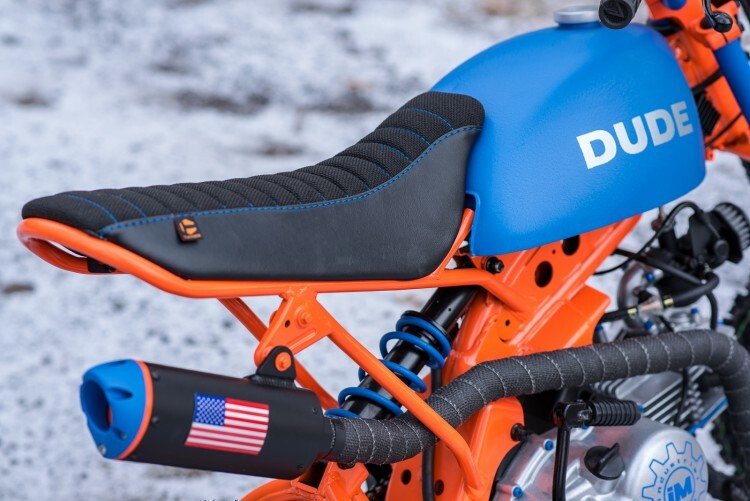 The powder coat finishes and a top quality custom seat will ensure that they stand up to years of use and still look good. 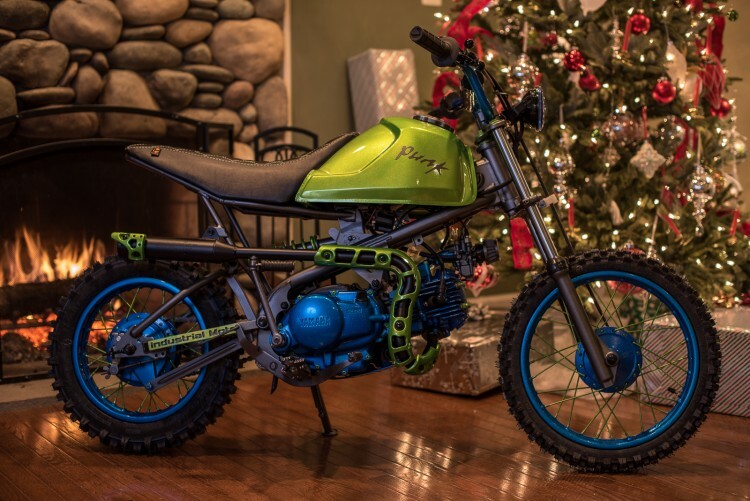 Christmas 2017 will be remembered as one of the best Christmases ever when you park one of these bikes next to your tree, even if your “kid” is 30 years old. 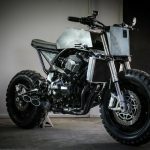 These are truly one-of-a-kind motorcycles.